On behalf of the 2018 WLA Awards Committee, we're thrilled to award ten Merit Awards to the below recipients for their commitment to Washington libraries. Click here to read the criteria for each award. Emeritus Membership(s): Recognizes an outstanding WLA member who has retired from library service prior to the annual conference, acknowledging consistent and outstanding service in WLA and for their years of service promoting and providing excellence in libraries. Honorary Membership(s): Recognizes an individual who has supported libraries who is not a library staff member by profession. An individual who demonstrated consistent and prolonged support of library service in Washington, and/or promoted legislative action, and/or participated in statewide committee work and other library activities. Advances in Library Services: Recognizes outstanding contributions by an individual who has been instrumental in improving library services. A member of WLA, currently working in Washington, whose personal efforts have increased library services to underserved areas or populations, providing access to information not previously available. Outstanding Performance: Recognizes an individual who has performed outstanding work for libraries. A member of WLA, currently working in Washington whose outstanding work in the area of public relations; technical services; rural librarianship; library instruction, digital inclusion, outreach services; support service; facilities; library education; promoting library values or other areas of library service. Trustee Award: Recognizes individual or group achievement by a Trustee/s for advancement of library services through the development of sound library policies or for wisdom, sound judgment and creative ideas in instituting library practices which have improved library services and efficiency. Friends/Foundation Award: Recognizes a Friends group or Foundation for effective advocacy of the library community; bringing its services and possibilities to the attention of the community and its leaders. Acknowledges their interest and contributions provided in support of library service. Candace Morgan Intellectual Freedom Award: Honoring the lifetime contributions of Candace Morgan in support of Intellectual Freedom and the Library Bill of Rights, this award goes to an individual, or group for their efforts to defend, champion, support and/or educate others about Intellectual Freedom in Washington State. WLA President’s Award: To be given at the discretion of the current or acting President. Examples are performance, innovation, or outstanding service. Outstanding Teacher Librarian of the Year Award: To be annually awarded to an active member of the School Library Division currently practicing in a k-12 school library position. Superintendent of the Year Award: To be annually awarded to a school superintendent who has demonstrated a noteworthy commitment to school libraries. Principal of the Year Award: To be annually awarded to a school principal who has demonstrated a notable commitment to school libraries. Small District/Private School Administrator of the Year Award: To be annually awarded to an administrator in a small or private school who has demonstrated a noteworthy commitment to school libraries. Supervisor of the Year Award: To be annually awarded to a library supervisor who has demonstrated a notable commitment to school libraries. CAYAS Visionary Service Award: Recognizes an individual who, through practice and example, provides inspiration and leadership for others who serve children and young adults in libraries. May work in a public, school or special library. May acknowledge cumulated efforts over several years in the field of library service to youth, or may be a singular and exceptional effort that sets new standards for practice. This award will bring attention to the remarkable and tireless efforts of all individuals who work with young people in libraries. WALE Outstanding Employee Award: Recognizes a member of WALE who has made significant contributions to or accomplishments in the library field. May recognize an innovative project or activity for a specific library in Washington or a support staff organization. Project and activities should directly involve support staff working in libraries or information centers and will have had an impact on the status and work of support staff. Individual has been active in WALE serving on a committee or in another leadership capacity. 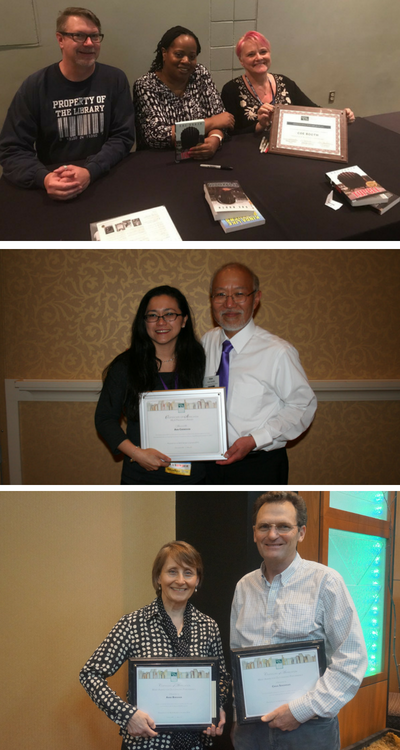 The American Library Association (ALA) offers more awards, grants, and scholarships.